What is it with them and the lack thereof? Do some people feel manners don't apply to them or that they are above it? A few weekends ago, my husband and I took our kids to the National Museum of Play In Rochester. It's a really fun place, but a super busy place - a child's wonderland, if you will. In saying that, kids will be kids; pushing, shoving, jumping lines, taking toys out the hands of other children, it happens, but when parents are standing by idly, playing with their phones and not watching them, it takes all my power not to absolutely loose my rag. As if I'd seen enough that day, we were leaving the museum and there was a boy, about 9 or 10 years old, holding the door open for a family in front of us to pass through with 2 kids and a stroller. My first thought was, "WOW. What a star!" As this family passed, they did without so much as a glance to this little boy. No 'Thank you', or 'How sweet are you?' Nothing. Seriously? All I could do was shake my head. A perfect opportunity to be an example to their own kids and they were completely oblivious to it. The amount of times I had to explain to my kids about the importance of being polite, using their manners, yet having to rectify others behavior is staggering. My kids are not perfect by any means, but my husband and I work really hard to ensure they say 'Please' and 'Thank You' without being prompted to do so. Growing up, manners were pounded into us. If we received something, whether a candy bar from Grandma, birthday gift from a friend, or a Christmas card from an Uncle or Aunt with $5 bill in it, a 'thank you' was instinctive and immediate. You could bet that same five dollars a thank you card followed almost immediately, with a phone call for good measure. I sometimes think my Mom may have gone overboard, but I get it now and I understand why she did it. The world of technology has never made it easier. You don't even have to pick up the phone or a pen anymore. For some people, even that seems to be a stretch. And it blows my mind daily. I was in a coffee shop the other day, listening to the exchanges between the baristas and the customers. This one guy, holy cow. Barista: "Hi, how are you? What can I get for you?" Customer: "Yeah, I want a grande coffee with steamed milk, blah, blah, blah....and please be quick, I'm in a hurry." Be quick? Uh, hey buddy, how about a "Hi, I'm good, how are you? (wait for response) Can I please have a....". There was more warmth in my hour old coffee than in him. And just for the record, that one 'please' he did manage to utter doesn't mean zip. Why should they hustle their tush because you have crappy time management skills? It's not their fault. Jerk. Personally, I feel this is half the problem with the world. There's no compassion between people anymore. It seems every man is for themselves, until a tragedy happens. Why does it have to take something bad for people to see the light? It's just not good enough. My favorite rude story was when I was returning an item to a department store around Christmastime last year. First mistake there. I know. There was a woman exchanging something from the kitchen department; wrong mixer or something. The girl behind the till took her information and told her to go find what she needed and come back to settle up. As I was waiting in line, the cashier took a couple more customers. The next thing I see, the mixer woman comes back, totally cuts to the front of the line, places the small appliance on the counter and proceeds to stand there as the cashier was helping another customer. No, 'Excuse Me' or 'Do you mind', the woman just cashed in her entitlement card. If eyes popping out of one's head were the fashion, this line would have been runway ready. The customer being waited on had a rightful go at her. Her retort? "I have things to do and the order is halfway done and she (pointing her finger right in the cashier's face, and quite emphatically I might add) told me to come back, soooo...." and proceeded to stand there, but not before she gave this poor woman a quick look over. Appalled doesn't do it justice. Speechless doesn't either. It's amazing that it took all of three minutes for one woman to upset the balance of another's entire day. It's also pretty amazing how delicious these Carmelitas are. The use of Caramel Apple Milky Ways give it that extra something special. Who doesn't like a little extra something special in their day? But please, don't thank me. It has been my pleasure, I'm sure. Preheat oven to 350ºF. Line a 9x9 square baking dish with foil. You can also use a 9x13 dish, but I like the thicker squares the 9x9 yields. In a mixing bowl, whisk together flour, oats, baking soda, salt, cinnamon and brown sugar. Add butter and mix until batter resembles coarse crumbs. Press half of batter into bottom of prepared baking dish, reserving the rest for the top portion. Bake for 12 minutes. If using a 9x13 dish, bake for 10 minutes. While crust is baking, in a saucepan over medium heat, melt caramels and heavy cream until smooth and completely melted. Remove from heat; set aside. Remove crust from oven. 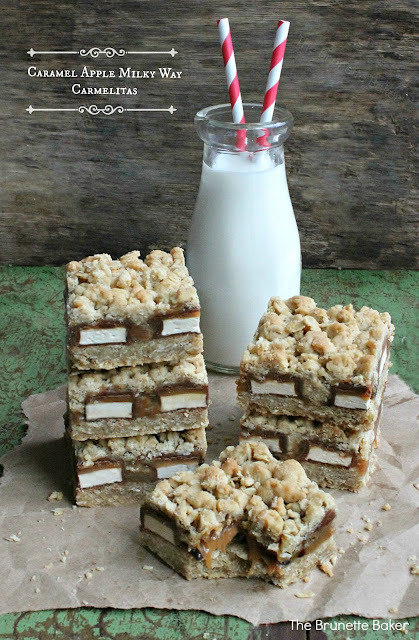 Line Caramel Apple Milky Ways in rows, then sprinkle mini chocolate chips in between. Pour caramel sauce over top. Sprinkle reserved oatmeal mixture evenly over surface. Bake for 15-18 minutes or until top is golden brown. Remove from oven and allow to cool completely. Once cooled, place dish refrigerator and chill for a couple hours before cutting. Trust me on this. If you cut too soon, the middle will not be set and you'll have a mess on your hands. Once chilled, remove carmelitas from dish. Carefully peel back foil and cut into squares. Enjoy. Thanks for the love, Liz. And you should definitely feel good about raising kids to be polite! It just seems that more and more, our society is losing the importance of manners. It's so sad. Wow, you went out of your way on these bars!! I am swooooning. I tried caramelitas the first time last year and fell in love -- adding the caramel apple milky ways is simply brilliant! And I toooootally understand what you mean about people and manners! My mom raised us the same way. On Christmas, we'd open all our gifts in the eeeeearly morning (like, 3am--is that normal? Don't answer that) and by 9 we would be writing our thank you cards already, haha. And I notice the same thing around the office. I'll hold doors open for people who just breeze on through and don't say anything. I always get my huffy pants on and yell "YOU'RE WELCOME!!" before storming away because I am a brat, but still -- how hard is it to say thank you?! Thanks so much for the love, Hayley! If I had a quarter for every time I shouted at a car that ignored the fact I just let them into traffic or held a door open for someone without as much as a look, I'd be living large off the coast of France eating all the bread and cheese I wanted. Manners should be a life requirement in my honest opinion. This looks amazing!! I love it!! I would love to invite you to link it up at our new party Lovely Ladies Linky where you link up once and get seen on 6 blogs!! Totally agree with you on the manners thing, there is no need for people to be rude. It certainly get's my back up when I see it. The caramelitas look delicious, I've never heard of them before. How to get your craving for a chocolate bar and a cookie satisfied at the same time...with these bars of course! Wow, what a recipe!